Zhangjiajie is a very popular tourist city. It is famous for its unique landscape of hills, rocks. This page will focus on How to Travel from Beijing to Zhangjiajie. The following are the steps you should do to travel from Beijing to Zhangjiajie. Step 1: Book a plane ticket or train ticket from Beijing to Zhangjiajie. There are airport buses, public buses and taxis available. 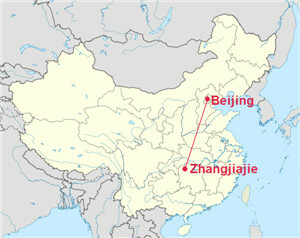 It is about 1500km from Beijing to Zhangjiajie. There are two direct trains available from Beijing Railway Station to Zhangjiajie Railway Station, which are K967(966) and K267 Train. Take Subway Line2 and get off at Beijing Railway Station. Step 2: Book a hotel in Zhangjiajie. Step 3: Book a tour in Zhangjiajie.